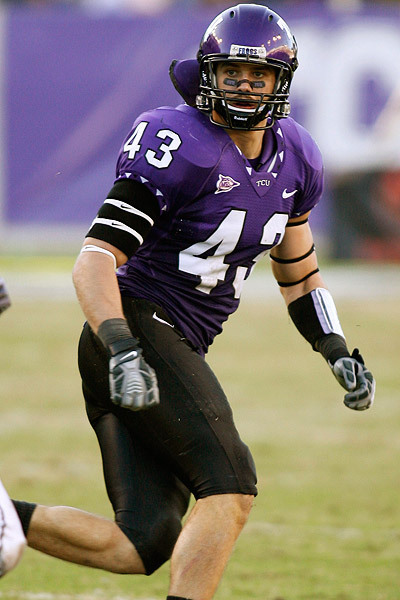 2009 Results: In 2009, TCU attained national prominence with its first undefeated regular season (12-0) since Dutch Meyer led the Frogs to perfection in 1938. They lost in the 2010 Tostitos Fiesta Bowl, 17-10, to the Boise State Broncos, on January 4, 2010. Home Stadium: The Horned Frogs play their home games in Amon G. Carter Stadium, which is located on campus in Fort Worth. The stadium opened in 1930 and holds 44,008. On November 14, 2009, TCU posted on its official Twitter page that night's game against Utah "broke the attendance record in Amon Carter Stadium with 50,307. Head Coach: The Horned Frogs are led by Gary Patterson, who will be entering his 10th year as head coach of TCU after taking over in 2000. In nine seasons at TCU, Patterson's 85 victories place him in second place on the TCU career victory chart, and he is the only coach in school history to record six 10-win seasons. His teams have only failed to reach a bowl game once (2004); the Frogs have earned a spot in the Final Top 25 seven times, if Patterson's partial season as head coach in 2000 is counted. 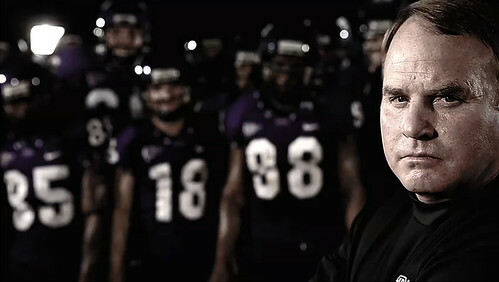 Patterson was named the 2009 AP Coach of the Year, becoming the first head coach of a non-BCS conference team to win the award. He won a total of seven national "Coach of the Year" awards in 2009 in addition to being named the Mountain West Conference Coach of the Year for the second time. This offense is one of the most explosive in the nation and will go as far as senior QB Andy Dalton takes them. Dalton enters his last year of eligibility and will be looking to lead the team once again while sophomore Casey Pachall is a more than capable backup if something were to happen to Dalton. At the running back position TCU is blessed with 3 young players who are all vying for some playing time. Starting the season as the #1 sophomore Matthew Tucker will look to impress the coaching staff. Backing him up for now will be another sophomore, Ed Wesley who has really been impressing the coaching staff in the preseason. 3rd on the list is freshman Waymon James, someone who is a bit of a wildcard this year. He doesn't expect to get that many carries with Wesley and Tucker ahead of him. Both Dwight Smith and Ethan Grant, the fastest HBs available for TCU, have been redshirted for this year. Every quarterback needs a "go-to" guy, and for Dalton that guy is none other than senior WR Jeremy Kerley. At 5'10'' Kerley is not the tallest receiver by any stretch of the imagination, but he is just able to get things done. If defenses are going to concentrate on taking away Kerley, the Frogs will be able to go to any of the next 3 receivers with extreme confidence. Lining up as the #2 is the only junior of the bunch, Antoine Hicks. At 6'2'' he is the tallest of the 4 receivers, and with his ability to break the tackle (80) and knack for the spectacular (86 spec catch rating) look for him to be a constant nightmare for opposing DBs. Lining up in the slot this year will be Jimmy Young, a 6'1'' 204 pound senior. Young is the fastest of the 4 top WRs and will look to create some mismatches. Finally, Bart Johnson rounds up the fearsome foursome. On any other team he would surely be one of the top WRs but he finds himself at the #4 spot here. Johnson will line up when the team comes out in 4 wide and will look to make plays, and with his catching ability (90) and his ability to catch the ball in traffic (82) he should be able to get a couple of looks each game from Dalton. Every defense needs a leader, and for the TCU Horned Frogs that guy is MLB Tank Carder. Even though he is only a junior, Tank has complete control of the team and is well respected by everyone on the team. Lining up to his right is a man who should break out this year, and that is sophomore ROLB Tanner Brock. Tanner is the fastest of the 3 starting linebackers, and his awareness (86) surpasses most people his age. Look for the Tank-Brock combination to cause problems all year to opposing offenses. On the backend, TCU has some players with some great playmaking ability. At corner they are led by junior Greg McCoy, with seniors Jason Teague and Malcolm Williams at the #2 and 3 spots respectively. Free Safety Tejay Johnson enters his last year and looks to take over the leadership role of the secondary, and along with SS Alex Ibiloye they make up one of the better safety combos in the nation. How will the Frogs do coming off of the success from last year? The preseason polls have them ranked at #8 in the nation, and one has to think that if they are to make a push even higher that they really cannot lose any games this year, which will be a tough ask for the guys this year, especially given the schedule. Anything more than 2 losses this year would be deemed a failure, but then again, would TCU fans be happy with a 10-2 record? The main focus this year will be to win the MWC title, which is something that everyone associated with TCU expects, and hope that we can keep our top 10 ranking and possibly challenge for a big bowl game, even if it is not the BCS bowl. With the way the schedule shakes out, look for the Frogs to end the year with a 10-2 or even 9-3 record as there seems to be many "banana-skin" games on the schedule this year.